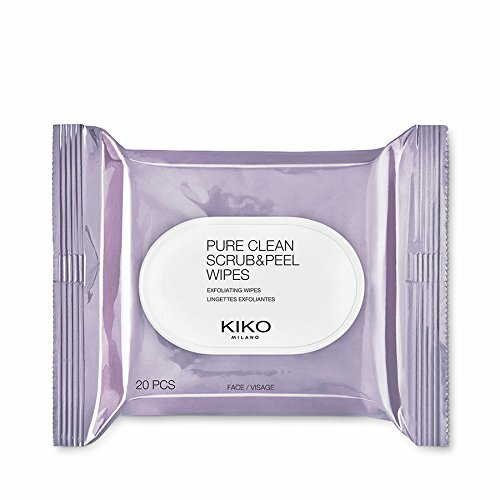 KIKO MILANO - Makeup Remover Pure Clean Scrub and Peel with two-side wipes. A package of 20 wet wipes that both exfoliate and refresh the face. Exfoliator and wipe, 2-in-1. Exfoliates and instantly refreshes the skin. Free from impurities, the skin has an even, smooth and radiant look. Ideal for all skin types. Use the textured side to exfoliate the face. Use the soft side to soothe the skin. Rinse the face after use. Reseal the package after use. Use no more than twice a week. Avoid the eye area. In case of contact with the eyes, rinse with water. Dermatologically tested on delicate skin. Non-comedogenic. Paraben free. If you have any questions about this product by Kiko, contact us by completing and submitting the form below. If you are looking for a specif part number, please include it with your message. Goldfaden MD Doctor's Scrub Grapefruit Oil, 3.5 fl. oz. MediDerm Microdermabrasion Polish and Exfoliating Cream - Scrubs and Exfoliates Dead Skin, Reduces Blackheads, Acne Blemishes and Fine Wrinkles. All In One Facial Treatment.